Here's a photo of custom sleeper trucks being worked on at ARI Legacy Sleepers in Shipshewana, Indiana. 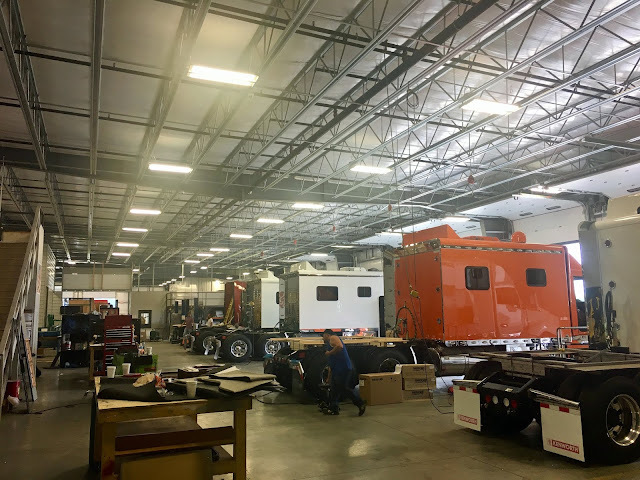 We stopped in to have a few things done to the truck and buy a few new parts and I got to see the addition they built and the new amenities they added. The last time we came through, I was sleeping so I didn't see the new building and other changes they made. They now have parking for at least 20 trucks, water, and power hookups, an RV dump, a gift shop, a small parts and sleeper accessories store, a beautiful driver lounge, vending machines, and the very best addition - two washers and two dryers! In the past, I've done laundry at the small laundromat in town, which was fine, but it's SO convenient to just walk across the parking lot and do a small load of laundry while we're here. I was thrilled to be able to get that done while we were waiting. Seeing all the new trucks they're building is very tempting. Ed and I have talked many times about getting a bigger sleeper, and we may eventually do that, but for now I think we'll just keep what we have an continue to save money until the truck craps out or we can't bear not having more space. It's always fun to come to take a peek at the new sleepers they're building and each time we pop in, I collect more ideas.